The owners have cleverly restored a group of outbuildings to create this small cottage. Through an archway clad with flowers, a pretty courtyard leads to the terrace and garden of the La Colombine. 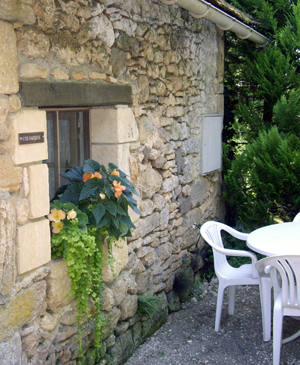 La Colombine is a very charming little house made of natural sandstones. It is situated in the shadow of a huge tree in the romantic park of Château de Roucaudou and it has been restored with great taste. On the ground floor of La Colombine there is an open kitchen and the living room has one sofa, two arm chairs, and a low table that accommodates 4 people. Behind the kitchen there is a spacious bathroom with an Italian shower, wash basin, and toilet. On the first floor (attic) there is the master bedroom with a large double bed (160 cm) and in the other bedroom there are two single beds (90 x 190 cm each). The closet is large and there is enough space to store all of your luggage. The whole interior is cozy and has recently been renovated. The living room has a satellite TV. In front of the house there is a large umbrella with elegant wrought-iron garden furniture so that you can relax and eat your meals in a beautiful garden setting. Kitchen: Well equipped, 4-burner stove, oven, fridge, toaster, coffee-maker, and microwave. Living Room: Satellite TV and dining table with seating for 4 people. Bathroom: 1 bathroom with a toilet and tub/shower. Outside: Garden, terrace, barbecue, big rectangular table with 4 wrought-iron chairs, big umbrella, and parking. Availability: Click Here to check La Colombine room availability.